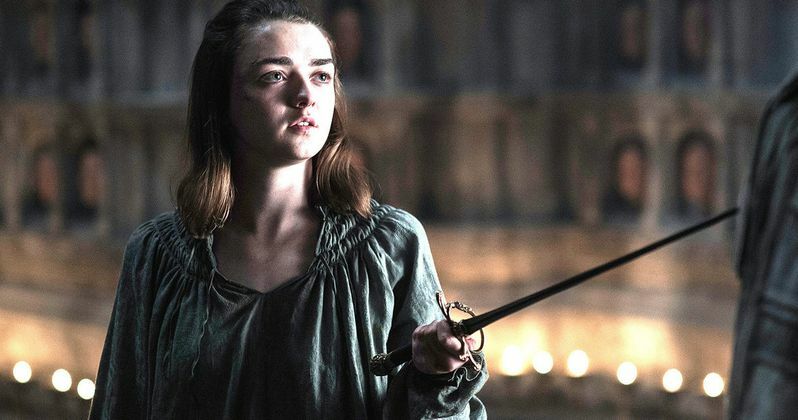 Maisie Williams says that her final Game of Thrones scene is "beautiful" and "perfect." The actress recently sat down for an interview to discuss the upcoming 8th and final season of the hit HBO series as well as her upcoming stage debut and The New Mutants. Taking on the role of Arya Stark has been a life-changing event for the 21-year old actress, who found the ending of her character in Game of Thrones to come at just the right time. When asked about the final season of Game of Thrones, Maisie Williams offered some information on Arya Stark's final scene. As it turns out, the actress was one of the last cast members to finish work on the massively popular series. She had this to say about her final scene. "I ended on the perfect scene. I was alone- shocker! Arya's always bloody alone. But I was alone and I had watched a lot of other people wrap. I knew the drill, I had seen the tears and heard the speeches. I got to the end and I didn't want more. I had exhausted every possible piece of Arya. And this season was quite big for me. I had a lot more to do. Mainly because there's just less characters now, so everyone's got more to do." Just because Maisie Williams was the last to film scenes for Game of Thrones Season 8, doesn't mean that the show will end with her in the final scene. Arya Stark has been on plenty of solo missions since the show started, and it appears that she'll be alone again during the last season as well, according to Williams. Game of Thrones showrunners are doing everything that they can to make sure that spoilers don't get out, which means that Williams is well-aware of what kind of information she's allowed to give away. Peter Dinklage was also recently asked about Tyrion Lannister's final moments in the Game of Thrones series finale. Much like Williams, the actor had to choose his words very carefully. While he couldn't mention specifics, he did say that he believes that he was given a good conclusion. He then added that even if Tyrion dies at the end of the series, that "death can be a great way out." Game of Thrones Season 8 is scheduled to premiere during the first half of 2019, though an official release date has yet to be announced by HBO. With that being said, it's looking like the show will premiere towards the end of May, or even early June. Visual effects artists will be working on the show all the way up until May, so it will be down to the wire when all is said and done. You can read the rest of the lengthy interview with Maisie Williams at The Guardian.